Swiggy Offers, Swiggy Coupons, Swiggy Cashback Offers, Swiggy Daily Cashback offer –HeyCoolzdeals Readers, We Hope all are enjoying Amazon Pay Balance Add Money Offers and take benefit of PhonePe Wallet Offers. As always we post amazon quiz first on the net with all correct answers. Swiggy is Giving many Cashback Offer Daily and Mainly this Offers are Available for All Users. In this Post we added All Possible Promo codes for Food Panda which can be Used Daily. 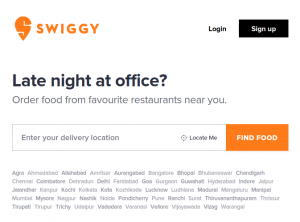 So, Guys Get Ready to Get Free Food From Swiggy. Also, Swiggy with PhonePe is Giving 50% Cashback. You have to Transact to get Full Cashback. This Offer Does not need Promo code for PhonePe. You have to just Transact 1st Time and Offer will Be Availed. You can order food & beverages online from restaurants near & around you. Swiggy deliver food from your neighborhood local joints, your favorite cafes, luxurious & elite restaurants in your area, and also from chains like Dominos, KFC, Burger King, Pizza Hut, FreshMenu, Mc Donald’s, Subway, Faasos, Cafe Coffee Day, Taco Bell, and more. Exciting bit? We place no minimum order restrictions! Order in as little (or as much) as you’d like. We’ll Swiggy it to you! 1.You will receive a flat Rs. 50 Cashback on your first and your second transaction on Swiggy via LazyPay and the same will be deducted from your LazyPay outstanding amount. 3.Offer is valid for transactions between 8th April to 30th April 2019 only. Use this Code After a SIX During IPL Match, Valid only for 6 Minutes. Get 30% Off up to Rs.70 with this Code. The Minimum Order Should be of Rs.149 to get Benefit of this Code. 5. Done. You will get as 100% Cashback up to Rs.100 + Rs.100 Off With Coupon. 6. So You got Rs.200 in Rs.50. A. Customers will get a cashback of 100% up to Rs.100, applicable to first time user of Amazon Pay on Swiggy in Dec’18. A. Offer is valid only on 22nd Dec – 25th Dec, both days inclusive. Get 50% off on first 5 orders on Swiggy. Nashik, Nagpur, Mysore, Jalandhar, Tiruppur, Kanpur, Vellore, Thrissur, Mangaluru, Trichy, Agra, Udaipur, Hyderabad, Bangalore, Chennai, Kolkata, Vijayawada, Aurangabad, Warangal, Manipal, Mumbai, Bhubaneswar, Trivandrum, Kota, Goa, Bhopal, Tirupati, Prayagraj, Madurai & Kozhikode. For Guwahati, this offer is valid only from 1st to 15th December. For Dehradun, this offer is valid from 7th to 31st Dec’18.